As I noted in the recent DS216j review, all of Synology's NASes operate using DiskStation Manager 6, providing a common set of features and consistent user interface. Of course, some higher end products support enhanced features, such as the BTRFS filesystem that aren't supported on J Series and Value Series products. 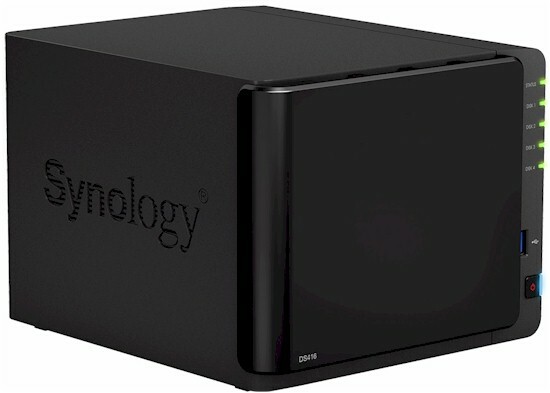 For the last several Synology products that I reviewed, I noted that Synology no longer had on online demo available. I'm happy to report that Synology now has an online emulator for the beta version of DSM 6.1. This link will give you a 30-minute session to explore the user interface. Of course, some admin features are disabled in the demo. You can also browse through the videos in their Knowledge Base, or download the DSM 6.0 User's Guide. The screenshot below shows the DSM 6 control panel along with the performance widget running on the desktop. This was created from the online DSM 6.1 beta. DSM 6.0.2-8451 Update 9 firmware was loaded onto both the DS416 and the DS416J and performance tests were run using the Revision 5 NAS test process. All tests were run on single RAID 0, 5 and 10 volumes created with four Western Digital Red 1 TB (WD10EFRX) drives. 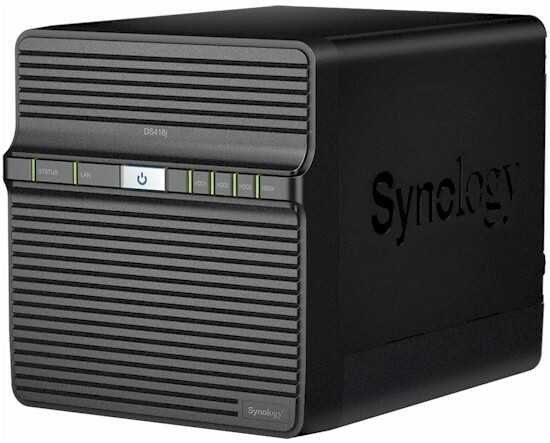 For this review, I am comparing only the Synology DS416 and the DS416j. File copy Write and File Copy Read results were consistent across all RAID levels (RAID 0, 5, & 10) for both NASes. All results were above 100 MB/s and approached the theoretical limit of single client testing on a single Gigabit connection. On the NASPT HD playback & Record tests, as well as on the NASPT 4x HD Playback tests, surprisingly, the DS416j slightly edged out the DS416 for all RAID levels. Several sets of tests results stood out. Looking at the NASPT Directory copy to NAS and NASPT Directory Copy from NAS, you'll see that both NASes turned in similar scores for RAID 0 and RAID 10. However, for RAID 5, the NASPT Directory copy to NAS (write) for the DS416 was 14.4 MB/s compared to 7.9 MB/s for the DS416j. The results were flipped for the RAID 5 Directory Copy From NAS (read). The DS416 turned in 13.0 MB/s as compared to the 18 MB/s turned in by the DS416j. The DS416 doesn't have USB 2.0 ports, so no USB 2.0 backup tests were run. For USB 3.0 backup tests, the DS416 clearly outperformed the DS416j with throughput more than double on two of the three file systems tested (FAT and NTFS). The DS416j edged out the DS416 on the network backup tests, but the DS416 again turned in better scores on both iSCSI Write to Target and iSCSI Read from Target. Using the NAS Ranker, I filtered for RAID5 class products, test method 5 and sorted by ascending price. The chart below shows the Total NAS scores for the eight least expensive four-bay NASes. The DS416j had a very respectable rank of #6 out of 27 products tested. None of three lower priced NASes had Total NAS ranks that came anywhere close indicating that the DS416j ranks very well from a price performance perspective. Applying the same logic to the more expensive #4-ranked DS416, there are no other products that have a better (lower) NAS Rank that are also less expensive. Looking at the subcategories, the DS416 had category wins for every category except for Video. As we noted in the discussion of the benchmark summaries above, the DS416j did indeed turn in scores that gave it a #1 Video category ranking for the 27 products that met our filter. The relatively poor results for NASPT RAID5 Directory Copy Write (#9) dragged the entire Write Benchmarks score down. Other categories, as you can see were very close for many of the tests. When you have two NASes that perform as similarly as the DS416 and DS416j, how do you decide which one to buy? Of course, the $60 or so (current as of publication) price difference can be a deciding factor. For others, the lack of hot swappable drives and the one-time hassle of taking the cover off to assemble the drives on the DS416j may be factors that will sway some people to opt for the more expensive DS416. Fortunately, there are also other criteria buried within some of the detailed specifications of the two products. You can see detailed specifications for the DS416, and DS416j. I've gone through the specifications and pulled out a few examples that help differentiate the two products. As you'll see in Table 1, in most cases, the DS416j has lower specifications, but remember, it's also an entry level NAS. The DS416, with dual Gigabit Ethernet ports, hot swappable drives may be overkill for someone who just needs a good performing full-featured NAS. If you're looking to use your NAS as a centerpiece for a video surveillance system, you'd probably want to opt for the DS416, as it supports 25 IP cameras vs. 16 IP cameras supported by the DS416j. Similarly, the DS416 can handle quite a few more VPN connections than the DS416j. But your network's router is a better place to terminate a VPN tunnel. No matter which you end up choosing, both the DS416 and the DS416j offer excellent performance at prices unmatched by competitors.